I am going to use this column to speak my peace about something that really irritates me: Lazy fat people hogging the handicapped shopping carts. When genuinely disabled people come to shop, there are often none available. I have watched in disgust as genuinely disabled folks struggle to shop in their wheelchairs with a basket across their lap, or a regular cart in front of their wheelchair. You may have seen them too. 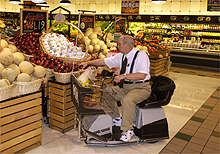 People who are able bodied need to get up, get a regular cart, and push it. What kind of things do things do these land whales usually have in their carts? Ice cream, cookies, cakes, pop, chips and just about anything else with no nutritional value beyond raw calories. What really makes me sick is when they use food stamps to pay for this junk. Why is that allowed? Those were meant for the staple foods that make a good meal so that nobody has to starve. Buying garbage snacks with them should be banned. I spoke to the manager of a local grocery store, who asked me not to use his name, or the name of the store for fear of a backlash. He confirmed that this occurs in his store. "I don't like it any more than you do. A few times, I or one of my clerks have confronted one of them, and it has lead to an ugly incident each time. They claim that being overweight is a genuine disability that entitles them to special treatment. In one of these incidents, an obese woman threw a can of pork and beans at one of my clerks while cussing him out. She hit him square in the head, knocking him out cold. I had to call him and ambulance and the police on her. When officers arrived, she was so belligerent that they had to use a Taser to subdue her. That clerk had been a really good worker, but he quit his job. After a few similar ugly scenes, I decided to just leave it alone. I can't put my staff at risk." Another problem that he identified, but one that is much easier to deal with, is kids playing with the carts. 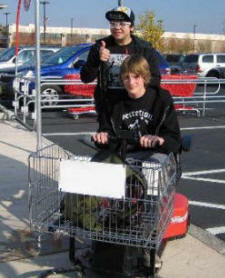 "When I catch kids messing around with the carts, I pounce on them, and they usually back right down. They know they will be in it deep if I have to call the cops, which I only do if they have destroyed more than twenty dollars worth of merchandise, or have run someone down. My store isn't a play room, and these aren't toys." I have contacted my state legislators and city council about this problem, and they seem completely oblivious to it. I don't think they are interested in passing a law that says motorized carts are only for the handicapped, and the able bodied may not use them. So what is the answer? Perhaps public scorn and ridicule will motivate the lazy to get off their butts, and leave the motorized carts for people who really need them.